ROBUST CONSTRUCTION: made of durable aluminum, this piece will last as long as your lights do or longer! The H995RICAT is designed for remodelling applications in non-insulated or insulated ceilings. This housings has LED connector and is dedicated for use only with our RL4 series of LED trims (sold separately). This air-tite housing is designed to prevents airflow between living spaces and unconditioned areas, improving comfort while reducing energy losses. This shallow housing is only 5-1/2 inches in height, allows for use in minimum 2 x 6 inch joist construction. The four pre-installed remodel clips easily secure the housing to any 1/2-5/8 inch thick hard ceiling material. The 5060P adjustable flush metal gimbal with a satin white finish is designed for our H5 series housings with PAR30 short neck lamps (housings and lamps sold separately). This trim is perfect for directional accent, the inner gimbal tilts up to 25 degrees and has 360 degree rotation, this trim can also be used for general lighting when flush with ceiling. The 5010 is a black step baffle with metal satin white trim ring designed for our H5 series housings with BR30 or PAR30 short neck lamps (housings and lamps sold separately). Dual socket position for the BR30 and PAR30 lamps. The baffle design traps and shapes light to minimize glare. The trim can be used for general or task lighting applications. The H5TM is housing is designed for non insulated new construction applications. It accepts a wide range of trim styles and finishes (sold separately). It also features an integral thermal protector to guard against misuse or improper lamping. This housing has the following features to speed up installation time; pre-installed bar hangers with regressed nail and self levelling feature, slide-n-side junction box allows for the wiring connections to be done outside, pre-installed push in wire connectors for faster electrical connections and pass-n-through bar hangers allow the mounting bars to be shorten without removing them. This housing is only 7-1/8 inches in height, allows for use in minimum 2 x 8 inch joist construction. 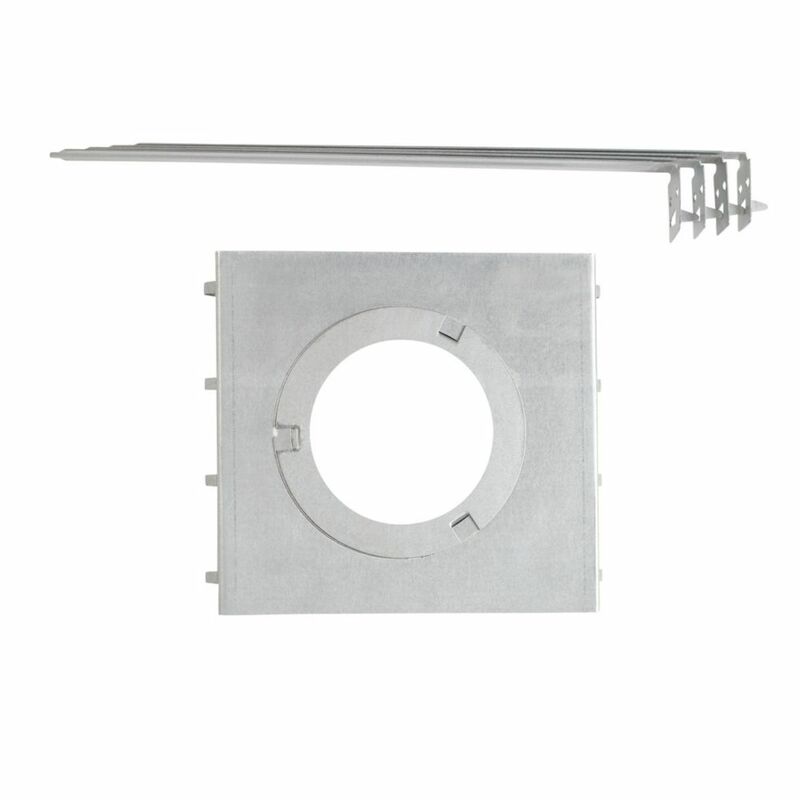 All-in-One New Construction Recessed Lighting Mounting Plate Globe Electric's All in One New Construction Recessed Lighting Mounting Plate can be used with most 3, 4, and 5-inch recessed kits and is ideal for use in new construction projects and suspended ceilings. Best used with standard strong to lightweight ceiling tiles (5/8 inch thickness). Four 12-inch hanger bars are included allowing for recessed remodel kits to be installed in new construction installations. Made of strong aluminum so your light is sure to be secure for a long time. All-in-One New Construction Recessed Lighting Mounting Plate is rated 3.5 out of 5 by 8. Rated 3 out of 5 by Anonymous from Sufficient for what I needed although it could have been... Sufficient for what I needed although it could have been a little stronger metal. Kind of flimsy and the hangers not long enough. Rated 5 out of 5 by Tocker from Great product. Enabled installation of integrated ultra-thin lighting before... Great product. Enabled installation of integrated ultra-thin lighting before drywall is in place. Now I can see if lighting is adequate or if I need to move lighting to splash walls etc. Once lighting is in it’s proper place and marked, I will take at least some of them out at drywall install. Rated 4 out of 5 by VetteDriver from I purchased these to go with the lights I am installing in a ceiling, but the lights are the re-m... I purchased these to go with the lights I am installing in a ceiling, but the lights are the re-mod type that really didn't need them. Using these assures the drywall installer gets the location of the lights correct without me having to measure and cut holes after the drywall goes up. They will also allow access to the preinstalled wiring. The only fault I find with these is that the plate slides freely back and forth on the brackets. That can easily let them slide out of alignment and ruin the installation location. They need a way to lock the plate in place on the brackets. I used electrical tape to prevent the plate movement. Drilling a hole to insert a screw would severely weaken the small thin brackets. Rated 2 out of 5 by Dan from Don't expect to use these hangers with a dropped ceiling. Don't expect to use these hangers with a dropped ceiling. Rated 5 out of 5 by Keith from Worked for me. Worked for me. Rated 1 out of 5 by ALB from The rails when extended, do not work to support the... The rails when extended, do not work to support the plate. They're designed badly. Also, they suppose to a have a guide so that they flush when installed on support beam on new construction but they do not. Very vague instruction. Rated 3 out of 5 by techops from These brackets are for a number of the Globe Electric recessed lighting fixtures when being insta... These brackets are for a number of the Globe Electric recessed lighting fixtures when being installed for new construction. The positive is they're manufacturer designed so you know it'll fit properly and it's priced very reasonably. Now for the drawbacks: First, for the smaller sized recessed cans (3" and 3-7/8") the inner ring needs to be removed. With the tabs you'd think a keyway had been cut in the larger (and also removable) ring and you'd just have to rotate the ring to align a tab with a keyway. Nope, not to be. Get out your slotted screwdrivers and needle-nose pliers, friends. Second drawback - and one more glaring for me is the lack of a lock-down screw along the side allowing you to lock the "sled" in place. With the current design you place the arms in through the tab slots on the side of the sled and attach the end of the arms to your rafter to secure. That's pretty standard with all can mounting kits. Now typically you can slide the sled along the arms to get your exact positioning and then use a lock-down screw to secure it into place - a feature that is missing on these brackets. Granted you can drill the sled along the arms and use a tek or sheet metal screw to create your own, but shouldn't a feature like that already be included?